Ladakh literally means "land of passes", and a local proverb states that "The land is so harsh and the passes so many only the best of friends or the worst of enemies would visit you." It is not just a romantic notion but an accurate description of the rugged scenery. 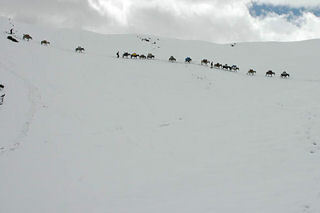 The southern part of Ladakh features countless passes, and it is this area between Ladakh and Zanskar that we picked for a three-week trek in summer 2006. On the way to our first high pass, Sirsir La, the scenery opens up after a day in a narrow canyon, and we climb up a barren slope with fine views of the valley. The arid landscape at 4'200 meters is stunning. The colourful rocks in green, red, and black make the scenery even more interesting. The few villages and their fields are visible from far away. The green barley terraces are a great contrast to the inhospitable surroundings. 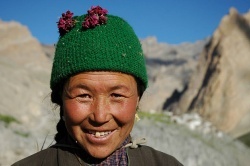 The local people seem to shrug off the adverse conditions easily; smiles greet us in every village and people take a break from harvesting to invite us for tea and Tibetan stew. After crossing the Zanskar river at Nyerak we spend three days in remote valleys that are rarely visited even by Zanskaris themselves. After a steep descent in a narrow valley we arrive on the plain near Zangla. The former kingdom was ruled from the fort that still watches over the village and the monastery. 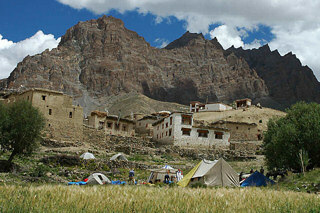 Two more passes and we arrive in Lingshed, a large village whose monastery is home to a large community of monks. We stay an extra day to walk around the valley and visit the gompa. On the way over the Singe La pass the weather gets bad. Snowfall keeps us in Photaskar for a day, and transforms the character of the landscape. The place seems wilder, the horizon further away, the valleys wider than before, and the mountains higher. Two hours after the snowy Sirsir La pass we're in a different world of yellow barley fields and colourful flowers. We follow the river down to Wanla and experience a wonderful sunset from the ancient monastery that overlooks the fertile valley with its tall poplar trees. After a short walk to Lamayuru we reach the end of our trek and drive back to Leh. The scenery was outstanding, local people very friendly, our route was diverse, the weather fine, our crew excellent, and my co-trekkers very nice. I can't believe how fast the last three weeks passed. Read details about our start in Leh. Kim and Joel from project-himalaya.com, Tenba and Phuntsok for delicious meals, Lobsang for being Lobsang, Andrea and Martin for joining and enjoying the trek.